When is a family trip to Orlando not a traditional Disney vacation? When it doesn’t involve a visit to the “Big Four” Disney World theme parks. Our family’s original itinerary included Epcot, a Disney water park and Universal Studios. But with just days to go before departure and no agreement among the boys as to which parks to go to and which rides to check out - we went to two Disney parks and Universal in California last summer - I called an audible. Since we couldn’t change our destination, I revisited our original plan to take a cruise. The hurdle would be our younger son’s refusal to sail, since he apparently has sat through one too many Shark Weeks on TV. My wife and I ultimately convinced him that all would be well, so I booked a three-night cruise on Royal Caribbean’s Enchantment of the Seas departing out of Port Canaveral, Florida. First up, though, would be an abbreviated stay in the Disney area, about 50 minutes west of the port. With thunderstorms delaying our flight out of Philadelphia, we ate lunch at Vino Volo in the D/E Connector. (There are other locations throughout the airport.) The four of us munched on variations of the braised pork tacos after sharing a plate of imported cheeses served with Glutino bagel chips. 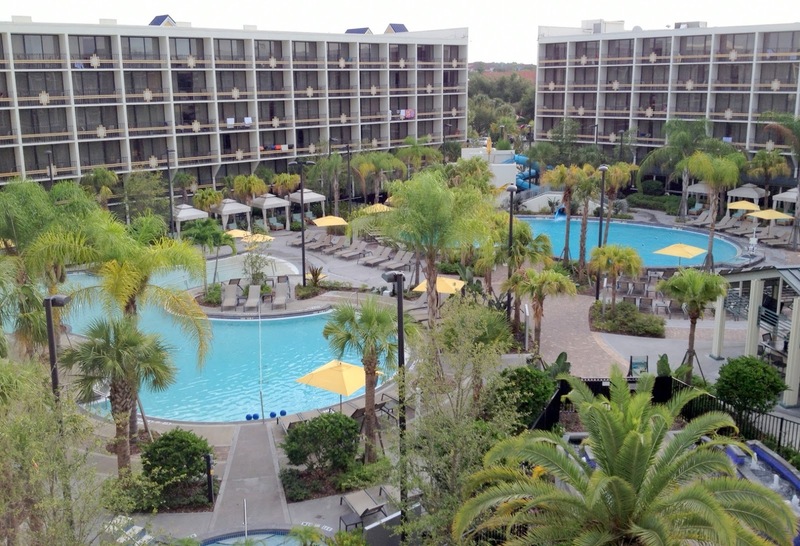 After a late-day arrival in Florida, we checked into the recently renovated Lake Buena Vista Sheraton Resort, just down the road from dining-and-entertainment complex Downtown Disney. Before the trip, our older son had done some research into gluten-free-friendly restaurants in the area and suggested the Elephant Bar, billed as a “Global Grill and Wok Kitchen,” in neighboring Orlando. As the tagline implies, the options indeed drew from many influences, but I found it overwhelming. The gluten-free menu was rather limited - three items to be precise - but from it our son settled on the Macau shrimp and rice noodle soup topped with grilled salmon. Although he liked it, there are too many other options in the vicinity to warrant a return visit. We ate breakfast the next two mornings at Zest, the hotel’s in-house restaurant. During our first visit, I spoke with the chef, who walked us through the safe options (scrambled eggs, potatoes, bacon and sausage, along with fresh-cut fruit). Disney has two water parks in Orlando: Typhoon Lagoon and Blizzard Beach. We decided on Typhoon Lagoon since it’s home to the largest wave pool in North America, though we had second thoughts on our choice since the pool was closed when we arrived, apparently due to mechanical issues. The pool reopened after a couple hours, so we were able to spend time catching some waves in between other activities like the lazy river and water slides. Our favorite was Crush 'n' Gusher, an exciting multi-passenger, roller-coaster-like raft ride. Disney parks on both coasts are well known for catering to gluten-free guests, and Typhoon Lagoon was no exception. Gluten-free pizza, hot dogs, burgers, chicken tenders, brownies and chocolate chip cookies were available at Leaning Palms, the water park's main dining facility. I asked to speak with a manager, who came out, took our son's cheeseburger-and-fries order, and handled the preparation from start to finish. It began to rain mid-afternoon, so we headed back to the hotel to relax and change for dinner. There are several gluten-free-friendly restaurants at Downtown Disney, including Raglan Road, an Irish pub serving gluten-free fish and chips, onion rings and calamari, located in the Pleasure Island section of the complex. We opted for Paradiso 37, which featured Latin and Mexican cuisine. We started the meal sharing a dipping trio, consisting of guacamole, chili con carne and spinach & queso. Since the tortilla chips were cooked in a shared fryer, the server brought soft corn tortillas for dipping. Our 12-year-old and I split a pair of entrees: chili-sauced chicken enchiladas with a side of tasty cilantro rice and black beans, and grilled baja fish tacos. 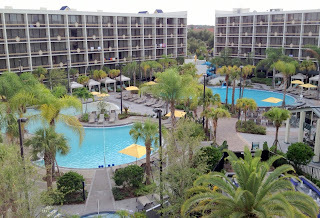 We spent the morning of our last full day in Florida poolside before heading out for an afternoon at DisneyQuest, also at Downtown Disney. 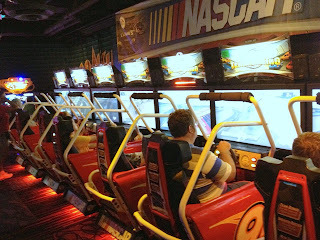 If you combine Dave & Buster's with interactive rides and games in your mind's eye, you'll get an idea of what DisneyQuest offers. 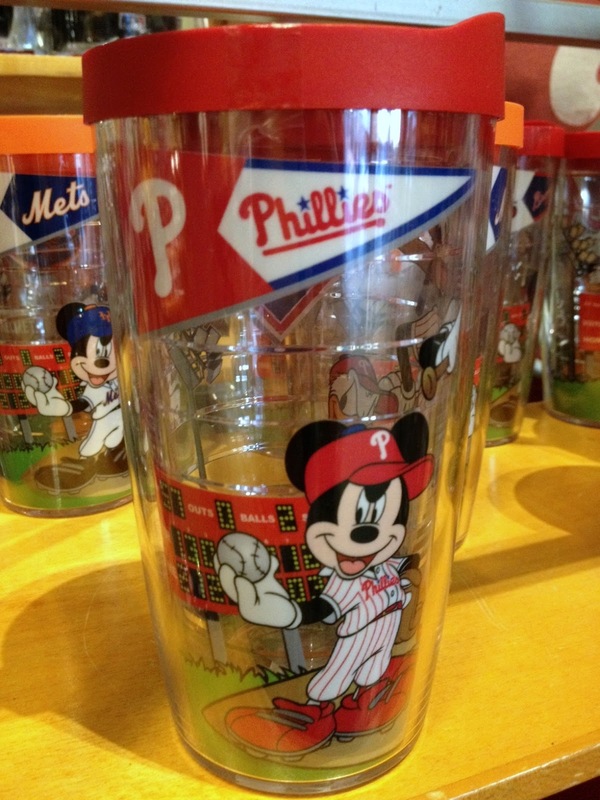 (Fun fact: Market Street East in Philadelphia was once rumored to be the site of a DisneyQuest.) It's five floors of everything from pinball machines and 1980s arcade games to a 3-D "Pirates of the Caribbean" adventure to a virtual jungle cruise. Admission includes unlimited interactive and arcade games. (Certain Walt Disney World ticket plans include access to DisneyQuest.) The FoodQuest dining area on the fifth floor offers gluten-free options. I had read that the BJ’s Restaurant & Brewhouse chain has many gluten-free choices, so we ate dinner at the Millenia Mall location in Orlando. From the gluten-free menu (which includes a variety of thin-crust pizza combinations), our son ordered a barbeque chicken chopped salad tossed with BBQ ranch dressing but sans crispy onion strings, along with a giant stuffed potato. 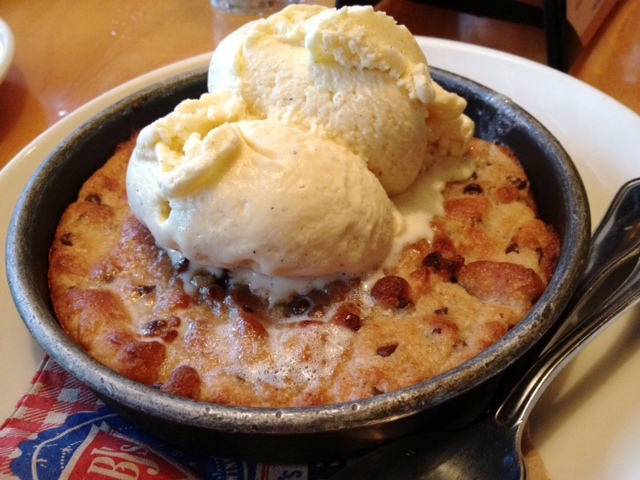 The dessert we shared was one of the best desserts I've ever had - a gluten-free chocolate chip Pizookie, a warm deep-dish cookie topped with vanilla ice cream. The manager who checked on our table mentioned that the chain will be making its way into the northeast U.S. in the next couple years, and I, for one, can't wait to eat there again. On the way to Port Canaveral the next morning, we stopped for breakfast at a familiar spot. 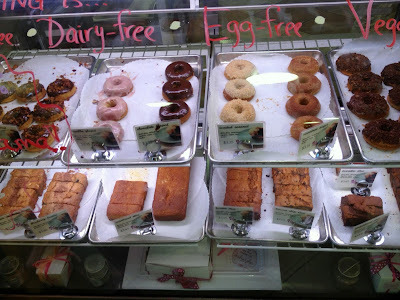 We've been to First Watch on prior Florida trips and are comfortable with the chain's gluten-free food preparation. Our son enjoyed a bacon and onion skillet hash, made with eggs and seasoned potatoes and blended with bacon, onions and cheese.